"Shanghai Knights" is about two guys who spend their entire time together fighting off enemies, plots of conspiracy, pickpockets, sexual urges, and in some cases personal stupidity on the road to maintaining an adequate partnership. Take away the faces of Owen Wilson and Jackie Chan, and I've just described the plot of any buddy picture dating back to the days of Abbot and Costello. It has become an accepted tradition, you might say, to revolve two knuckle heads such as these around big and moronic adventures because it provides a wide array of possibilities for them to leap from. That doesn't mean the result will always be an inspired one, but when is it not amusing to see two unlikely heroes match wits for a common goal? 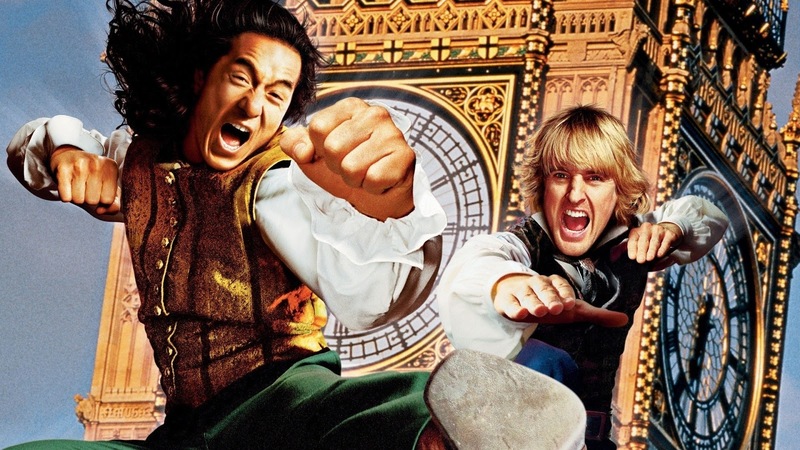 The buddy movies of the recent past aren't exactly the most enthralling experiences for us to endure (consider the recent "Kangaroo Jack"), but with "Shanghai Knights," Wilson and Chan find an amusing chemistry together that has been missing in this setup for quite a stretch of time. They also have an undeniable sense of comic timing, some of which feels directly influenced by the best of the Cheech and Chong flicks of the 70s. Here, plot is not nearly as important as dialogue or action, but that's okay because it's all fueled by personality. The movie is hardly breathtaking or a completely successful endeavor, but considering what's been stinking up the box office over the recent weeks, it's quite a respectable diversion nonetheless. 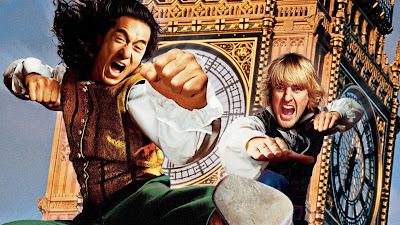 As most probably already realize, "Shanghai Knights" is actually a sequel to "Shanghai Noon," a 19th-Century-based western comedy which I am currently unfamiliar with. As this movie opens, we're taken into the secluded walls of China's "forbidden city," where the keeper of the Imperial Seal and his daughter Chon Lin (Fann Wong) are attacked by British natives who have come to steal the artifact from the Chinese empire. In the process, the keeper is killed and Chon is forced into hiding, but not before she informs her brother, Chon Wang (Jackie Chan), of the incident, and follows the villain back to Britain. Chon, meanwhile, lives an accomplished life as a local sheriff in Nevada, but when he hears of his father's death and his sister's journey, he doesn't have to think twice about meeting with her in England in order to avenge the life of their father. In order to do so, however, the Asian is forced to drop in on his old pal Roy O'Bannon (Owen Wilson) in New York, who we are told has the financial assets to send the anxious guy overseas. Unfortunately, Roy's luck with money hasn't exactly been great since the two men parted ways, and when Chon Wang finds him, he is a hotel waiter who doubles as a gigolo by night. Nonetheless, in an effort to get to the intended destination, both stow away on a cargo ship so they can hightail it into the crowded streets of London looking for answers. Upon arrival, they discover that their nemesis, Lord Rathbone (Aidan Gillen), is involved in a plot to overthrow the English royal family and have himself placed on the throne. The movie's best stretch of laughter comes at about the halfway point, when both men (and an escaped Chon Lin) venture into the mysterious Lord's corridors to seek out the Imperial Seal of China and get caught up in a layered fight sequence involving a rotating wall and two chambers on either side. During other points—some of which can be seen coming from a mile away—the screenplay's sense of humor is more involved with specific reference jokes (like one involving the marketing potential of Zeppelins) or lines of parley ("The Great Wall ain't the only big thing in China"), neither of which are often as funny as specific moments of action. That, of course, keeps the experience of watching "Shanghai Knights" down a level than what is possible, but thankfully the overdone dialogue and historical gags don't suffocate the comic merit entirely. Wilson's embrace of childlike naivety and Chan's consistently-ambitious use of martial art stunts have spirit and valor that leave the audience grinning from ear to ear, and even if the movie they're in isn't exactly a perfect vehicle for all-out chuckling, it still is an enjoyable experience in the end.